The Atlanta Braves will play their final Spring Training season at the ESPN Wide World of Sports in 2019, and the schedule of games has been announced. 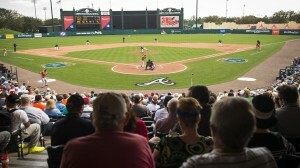 The Braves’ spring training will include a total of 16 home games at Champion Stadium against teams including 2017 World Champion Houston Astros, New York Yankees, New York Mets, and St. Louis Cardinals. The final game for the Braves at Champion Stadium will be March 23 against the Mets. Tickets go on sale November 19 and are are available through the Atlanta Braves’ website, ESPN Wide World of Sports box office, and Ticketmaster (1-800-745-3000).